White sugar is known by many names, including sucrose, table sugar, cane sugar, beet sugar, grape sugar, refined sugar, or granulated sugar. It is derived from the juice of sugar cane and sugar beets. Once extracted, the sugar cane or sugar beet juice is processed extensively to produce a white, granulated substance. “Invert sugar,” a variation on sucrose, is used commercially because it is sweeter than equal amounts of sucrose. Raw sugar is produced in the initial stages of white sugar’s manufacturing process. Raw sugar is coarser than white sugar, and is brownish in color. Although true raw sugar is banned in the United States because it may contain bacteria, molds, or insect parts, manufacturers partially refine raw sugar to remove the impurities and sell the product as “demerera,” ”turbinado,” or “muscavado” sugar. 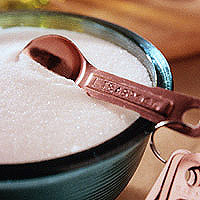 Brown sugar is made by adding molasses to white sugar. Confectioner’s sugar, or powdered sugar, is made by pulverizing white sugar. It also contains cornstarch to prevent the formation of lumps. Corn syrup (e.g., Karo® syrup) is a highly-refined, quickly-absorbed light colored syrup derived from corn. Also known as high-fructose corn syrup (HFCS), it is intensely sweet and inexpensive. It is manufactured by changing the glucose in cornstarch to fructose. HFCS is a major source of sugar in processed foods. It is added to canned and frozen fruit, soft drinks, juices, and a great many other packaged foods. Dextrose is a form of glucose produced from cornstarch. It is commonly used in food production. Molasses is thick, dark syrup produced during sugar refinement. It has a strong, bittersweet flavor.